A brave and magical book, Voluspa: Seidr as Wyrd Consciousness is a deeply original commentary on the lived experience of an ancient wisdom text. Intelligent, thoughtful, well-informed, and practical, this comprehensively researched work is a necessary foundation to understanding not just Seidr, but the nature of spirit in Northern Traditionalism. Valarie Wright is a pathfinder who expertly translates and explains the lost-legacy of Voluspa – the ancient poem of Creation and creators – and how these mysterious, profound, and insightful words and practices can be lived successfully today! Forn Threifa: Ancient Healing Touch is a masterpiece of traditional energetic folk healing. It pulls together the primary sources to detail the “healing hands” of Seidbearers, Cunningfolk, Druids, and those other pre-Christian healers of renown. You will learn: The Source of Healing within yourself, and the role of Healer in daily life; How Health is related to being Whole and Holy, and of the Healing Women and Men of Lore; the nature of -Cursing and the Healing Oath, and those Healing Wisdom Traditions commonly used throughout European (Celtic, Germanic, and Slavic tribes) that the Church tried to ban; and the Five Part Healing Method found repeatedly in Heathen Lore that assures success. Where most bemoan that ‘there is not enough references to seidr in the lore’, scholars like H.R.E. Davidson writes: “As far as Old Norse literature is concerned there is little reason to complain of the scantiness of the field, which is bewildering by its richness rather than depressing by its barrenness”. Taking this to heart, Valarie Wright has researched and studied Seidr for forty-years, to discover the numerous mentions that have been preserved, and to assess carefully the extent of the Seidr weal at our disposal. Now, this treasure can be yours! Do you Know the The Eight Steps to Seiðr, or how to arrive at this life’s journey? Are you looking for a hands-on Seidr format? Do you feel overwhelmed by the spread-out references and dead languages? Are you ready to answer the Wild Call that seethes beneath the surface of your skin? Then it’s time to Ride the Hedge, Run with Wolves, and Galdr Aloud the Eight Whispers of Seidr Wisdom! Heathen Anthology: Volume One. Valarie Wright has been researching Seidr in an effort to increase the stock of applicable, cultural, and historical knowledge to reassure that the skills and abilities of yore are not lost. Heathen Anthology represents decades of essays that document, discovery, and develop the methods and systems of Seidr. Volume One includes historical citations on Ymir and the Four Dwarves and how they define and explain the traditional ideas of sacred space; of how Frey and Freyja became the Lord and Lady of Witchcraft; and how the Nine Herb Galdr can heal you today. If you’re are ready to move past beginner-101 books, to delve deeper into the ancient wisdom teachings of Sacred Space, of the Divine Twins, and Healing Herbs, then Volume One awaits you! Heathen Anthology: Volume Two. Valarie Wright has been researching Seidr in an effort to increase the stock of applicable, cultural, and historical knowledge to reassure that the skills and abilities of yore are not lost. Heathen Anthology represents decades of essays that document, discovery, and develop the methods and systems of Seidr. Volume Two includes historical citations on Hel, Halja, and the Dark Mothers of Germanic Heathenry; intimate information on Nerthus and Her annual sacrifices; and the revelation of the Dark Runes and how one can use those for personal gain. If you are ready to move past ‘safe’ books, to explore the Dark Goddesses, Gygjars and Matrons of Death, of Nerthus and human sacrifice, and the injurious practices of Dark Runes, then Volume Two awaits you! Patreon: Valarie Wright researches, studies, and applies the cultural-historic applications of Seidr. As an antiquarian and academic, she is dedicated to the positive promotion and preservation of Old European spirito-mystic culture and heritage. 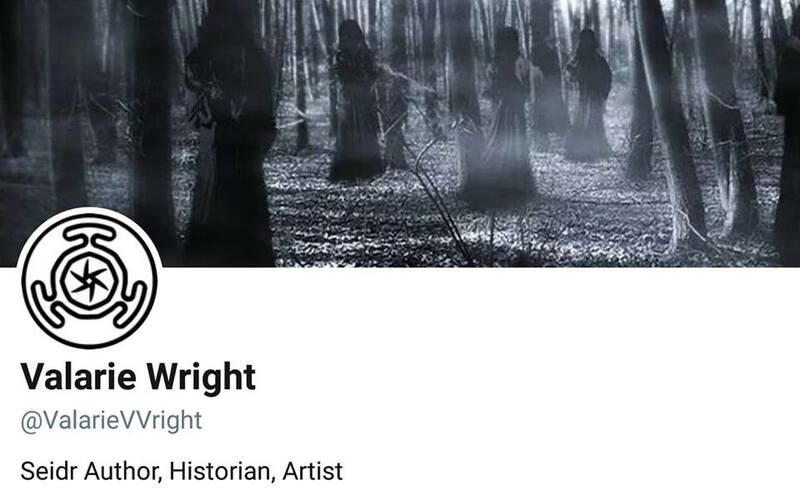 Wright uses literary, historical, and archaeological evidence to explore the customs of Old Europe, to include Germanic, Celtic, and Slavic folkways. She has written six books and numerous essays and asks for your support in these endeavors. Honestly, I have no idea what price to put on this level of dedication towards such a sacred practice with applications for all of us. Not only is it near and dear to me, but it’s important for all of us today who struggle with the shackles of a Christian upbringing. Every time I meet Heathens, I meet families, and they are struggling to reclaim their ancestral heritage. Right now, I can only assist a few of these families, and my goal is to reach more in need of this information. Would you be willing to contribute 1$ or 3$ a month to help me reach more Heathen hearths? Facebook: Seidr, akin to Facebook, is like being in the Flow – or that feeling when one is totally and happily engrossed in a project or skill. Valarie Wright is a Seidwoman, and joyfully shares the Flow of Seidr – from its comprehensive exploration and philosophical perspective, to its deep nature and mystical meaning. When you “like” a Seidr observation, you are connecting to Seidr; you are affirming that you ‘get it’. More than nodding your head in agreement, after reading a post, a ‘like’ confirms an ineffable affinity. It’s the most practical and immediate way to relate to and with Seidr. And when you “comment”, that is a reflection of your inner being. So to find value and definition, and/or grow and nourish your Seidr practice, respond here often and much! Twitter: Seidr is relevant, personal, and influential. Exploring Seidr – and its underlying meanings – is a tool of self-actualization. Removed from tribes, perhaps even kindreds, Twitter helps us reconnect in crucial and ancient ways: sharing information. Twitter is open and concise, the perfect platform for Seidr’s Wyrd Consciousness sound-bites; sometimes all we need during the day is the ‘perfect’ phrase to awaken us from our stupor to expand into Ginnunga-gap. Seidr is the river. Twitter helps us follow its course. Wyrd Consciousness awaits at the outer edge of human consciousness. Whirlpools and ripples reach us through Twitter waves, to enrich us. Paypal: Or, if you simply want to support the work I do, remember, contributing to Paypal is not a business transaction but a human connection. Seidr is about meaningful connections, because it helps us make a difference in our life. To help the research and discovery continue, to memorialize the Seidwoman of yore, to be part of a Seid community, to bolster the Folkway and build spiritual morale, because its personal, to act with your heart and not your head, to impart generosity, to say “I genuinely care about the future of Seidr”, because Seidr research, study, and sharing matters. Invitation: For those who Seid, you do not have to walk alone. For four decades I have been clearing the path. Along the way, I grew increasingly more distant from Asatru and Heathenry for denying those who seek answers from Seidr, from the Cunningway and Wortcunning, from Forn Threifa and Trolldom, from Berserkergang and Rune Art, and from mysterious and forgotten arts yet told. Much and more have I learned from Jotun and Gygjar, only to have those who know-nothing of these Old Ways, who cower in ignorance and fear, call such deeds “dark”, “new age”, or “not-Heathen”. Wise Home is a place that changes that. It is a shared table of research, study, and living lifeway for those weary of the outside world. If you dare, join the good folk who sit and share at that table.